These techniques have worked for me but there is no guarantee provided. Use at your own risk. Always make a backup of important files before attempting any troubleshooting. I've assembled this top10 list of troubleshooting techniques from my own experience as well as from Twitter, Facebook, Apple support forums, Creative Cow forums, etc. If FCPX starts to act wonky, try these top 10 steps. 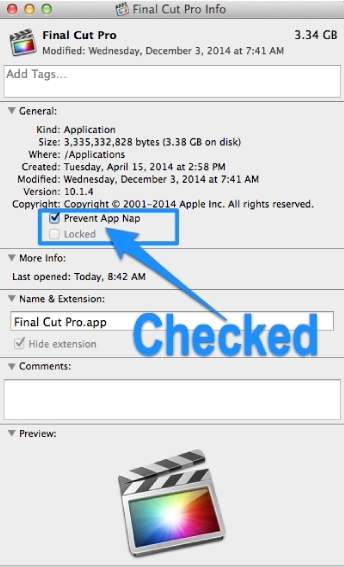 Make sure "Prevent App Nap" is checked in FCPX's Get Info window. A step-by-step tutorial to disable App Nap is located here. Update FCPX (currently 10.1.4) and the Pro Video Formats (currently 2.0) to the latest versions via the App store. These updates include new functionality, bug fixes and improves FCPX performance and stability. Just meeting the minimum specs will give you subpar performance. Exceed them. If you are experiencing FCPX slowness, stuttering or seeing the beach ball, read this article. Back up your Libraries before you start troubleshooting. Backing up should be part of your everyday workflow. FCPX now creates an automatic Backup file that is updated every 15 minutes with any changes you've made to your Project or Event. 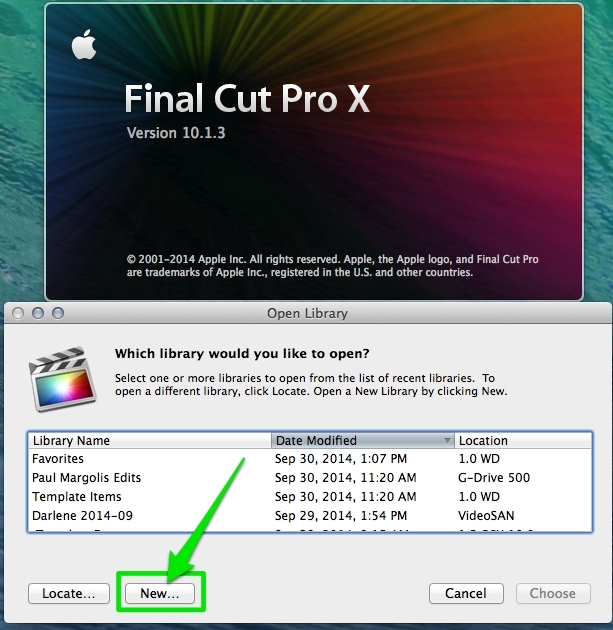 This file will be used when launching FCPX if the original Event or Library file is corrupted. Reference the FCPX manual especially if you are not that experienced with Final Cut Pro X. If you don't clearly understand how FCPX works, you are liable to spend unnecessary and unproductive time troubleshooting. Launch FCPX with a new Library. Hold down the option key while launching FCPX and create a new blank Library. If FCPX launches OK opening a new blank library, then the problem is not the FCPX app but probably lies with one of your Libraries. Open one Library at a time to see which one is causing the problem. 02) Try some OS level troubleshooting; Log in as a different User. Trying a fresh user account will utilize fresh preferences, fonts and no 3rd party plugins and eliminate those items as suspects. Clear potentially corrupted caches and fix some system problems by performing a Safe Boot. Hold down the Shift key while starting your Mac until you see a gray progress bar under the Apple logo. a) Forces a directory check of the startup volume. d) Moves font caches to the Trash. e) Disables all startup items and login items. Reboot after Safe Mode finishes starting up and try FCPX. 03) Disconnect all external drives. I've had problems launching FCPX with multiple external drives mounted. Try disconnecting all external drives and see if that fixes your problem. If it does, reconnect one drive at a time until the problem returns and you've identified the problem drive. Test your project on a known good drive. or by shutting down your Mac, waiting 60 seconds and rebooting. If I have playback issues, a disappearing skimmer or other unusual interface issues, this is one of the main steps I try. 05) Only open the Libraries you will be using during your current session. If you have dozens of Libraries open, it makes troubleshooting more complex. I usually only keep a few Events per Library for easier troubleshooting. play the Library's media files in the Finder with Quick Look or Quicktime. If you find one file that won't play, that is your suspect. Remove it and try FCPX again. by holding down the option & command keys when launching FCPX. This is a useful troubleshooting technique for corrupt preferences but should not be the first thing on your troubleshooting list. In my experience, I usually find another solution without trashing preferences. 08) Slowness (spinning beach ball) or hangs in FCPX. Close all other Apps. Also test your hard drive speed. If it is less than around 70MBs, that could be your bottleneck. USB 2 external drives are just not fast enough. Firewire 800 is the bare minimum. Next cancel background tasks. Launch Activity Monitor to see what is taking up your system resources. It is located in your user > Applications > Utilities folder. 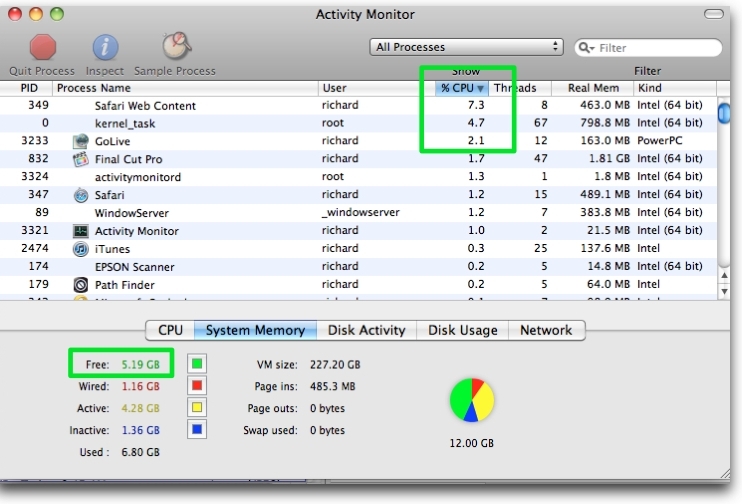 Pay special attention to Free memory and application % CPU usage. Low Free memory or an application with high % CPU numbers could be causing the spinning beach ball. Shut down most other applications while using FCPX to help if you have this problem. Two helpful articles about using the Activity Monitor are located here and here. Close windows that you are not using in Final Cut Pro. If you are not using the Inspector, Video Scopes, Multicam Angles or the Library, close those windows. 09) See if others have reported your problem. Check an FCPX Facebook group or FCPX user group or visit the Final Cut Pro X Apple Support page. Read the FCPX manual to see if you are performing a technique wrong or expecting FCPX to do something a certain way that it does a different way. 10) A few more troubleshooting steps. A) Cancel all background tasks if you experience freezing or hesitation. What does Background mean? Background Tasks aren't always background in FCPX. I have found that Background Tasks in FCPX can overwhelm foreground tasks. They don't always operate in the background, as you might expect a background task to do, but will actually prevent, freeze or delay foreground tasks. They are supposed to pause when you are using FCPX but I've found this only happens with some tasks. If you experience freezing or stalling in FCPX, and Background Tasks are running, cancel Background Tasks until you want to engage them or when you take a coffee break. 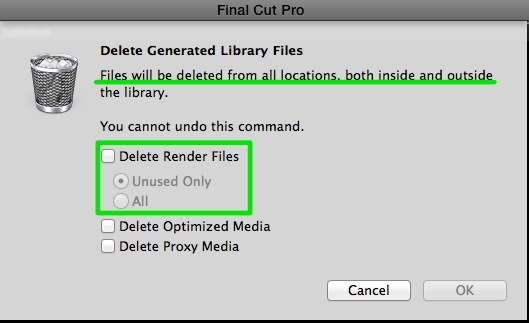 B) Delete all render files and restart FCPX. Select a Library or Event and choose File > Delete Generated Files. Choose "All" if you suspect a render file is causing your problem. Of course you will have to re-render everything if you choose this option. Also zoom into the timeline and look for any red bars above your clips. Red bars means there is a problem or missing media/effects at that location. C) Copy and paste all of your timeline clips into a fresh project timeline. This can be caused by a corrupt clip or render file or a problematic destination (such as not enough space or other problems). Use a process of elimination to zero in on the problem. Try sharing another timeline in another Project to see if your sharing problem is just with a certain timeline. Try setting a new destination with enough hard drive space. If sharing to an external drive, try a different known good drive. Try sharing one half of your timeline at a time. If one half will export but the other will not, you probably have a corrupt media file or render file in the failed half. Try removing media to narrow down the problematic clip(s). If you get an error pointing to a specific frame, set your timeline preferences to show frames and look at the questionable one. Copy all of the clips in the problematic timeline and paste them into a new timeline. Try exporting this new timeline. If all of the above techniques fail to help with your FCPX problem, try a fresh install of FCPX. After FCPX finishes downloading and installing, make a back up copy and store it on a removable hard drive or memory stick, for future troubleshooting. Apple recommends not having more than one copy of the FCPX app on any mounted partition. Copyright © 2015 Richard Taylor. All rights reserved.